Back to Sanrio character bento. 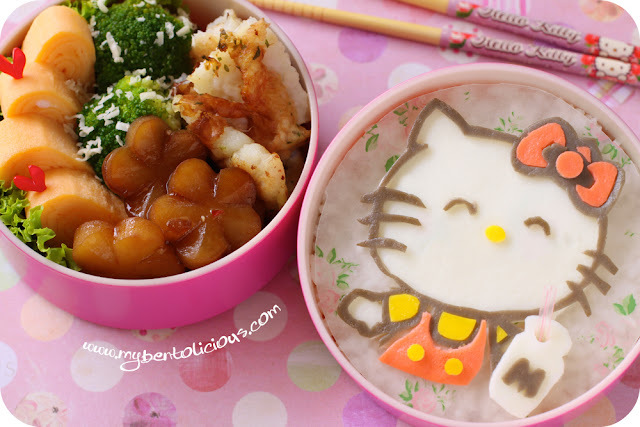 For today's bento, I chose Hello Kitty to put in the new 2 tiers pink box that arrived yesterday from Bento&co. I bought the white one previously and just love it. Perfect size for my kids' lunch. This bento was made for Audrey and Andrew still has his lunch from school catering. I made the Hello Kitty from the colored egg sheets except for the white and yellow part. I used food coloring to get the red egg sheet and dark soya sauce to get the brown egg sheets. The hard part was to cut those brown outlines, have to do it slowly and carefully. This time although all the egg sheets are edible, I put wax paper on the top of the rice so if my girl don't want to eat it she can easily remove the Hello Kitty by moving the wax paper from the top of the rice. Inside the bento : tamagoyaki, pan fried pangasius fish fillet, broccoli & cheese, and sauteed potato flowers in dark soya sauce. I linked this bento to 'What's For Lunch' every Wednesday at Shannon's blog. You can join the fun too! I took the picture of Andrew while he wrote something on Audrey's cast yesterday. He wrote carefully because he didn't want to hurt his sister. sorry to see your girl in a cast. Wishing her a speedy recovery! Look at them, sooo cute! Li'l brother must be feeling sad as well with her sister's situation. @Rio : Thanks a lot Rio! @purple angel : Thanks a lot Sysyl! I want to write on her cast just like @karaimame! lol. That is the sweetest little pic of A & A. Oh they're both adorable.. The HK is amazing! Also, I have no idea how you did the potatoe flowers but they're awesome too. Your bento is beautiful! I am impressed with your skill. That is so sweet that he was afraid to hurt her arm. Awww. such a sweet pic of A & A, and she already has so many autographs on her cast! i LOVE this hello kitty, great idea to put it on the wax paper, and your lines are perfect. the soya-simmered potato flowers are very pretty, bet those taste great with the yummy tamagoyaki slices! Oh, your children are sooo adorable Lia....be all better soon Audrey! Lovely bento in your new set! I have this set too and you've really inspired me with this yummy, artistic way of filling it. Best wishes to you and yours! Wishing your girl a speedy recovery! Really salute your patient to cut out the HK! You are superb! Did she eat that cute Hello Kitty? Maybe only after showing all her friends! Such detailed work; you're really super-skilled Lia! From Auntie Sheri to A: ♥ ♥ ♥ ! Aww..your kids are so cute! What a sweet photo that is. I love your hello kitty and what patience you have with the detail! I want that pink 2 tier bento, it's just perfect! I like the potatow flowers and they look so tasty too. Awww .. so sweet!!! love to see that picture of your kids ^_^ and I love your bento to off course. Always cute always inspiring. I love the cute Hello Kitty ...! Just bought a hello kitty smartphone some time ago as well and loving it ;) - I was never very into Hello Kitty, but now I somehow like it...!! Btw, the picture of your children is really adorable :)! What a sweet picture of your children! Love the Sanrio characters - you do a good job re-creating them. Such an amazing Hello Kitty made out of egg sheet! You are so talented, Lia! And that is very sweet of your boy to be so careful about signing his sister's cast. I had a cast on my arm when I was 12 and it was a memorable experience. I hope she heals well and quickly. Great job, as always! Beautiful bento- I love the flowers! Sorry Lia, I missed some of your posts recently due to my time being occupied and I was sick too. Love that Hello Kitty and wish your girl speed recovery! I admire your patient to do the outlining Lia..I wouldn't have so MUCH patience LOL. It turned out so lovely of HK! What a sweet brother and I hope she heals quickly. Your HK is amazing!!!! Love the way you did the Hello Kitty! I can see it takes a lot of time to cut the outlines! Audrey is looking good... hopefully her bones will heal well and a speedy recovery to her! Wishing Audrey a speedy recovery! Tell her that I broke my arm when I was her age and I'm fine now...can still make bentos! :) Bless you and your wonderful family.